For your practice to succeed, you need to master twelve management skills. You need skills for managing staff, managing patients and managing a business. You need skills for marketing your practice, collecting from insurance companies and controlling your overhead. 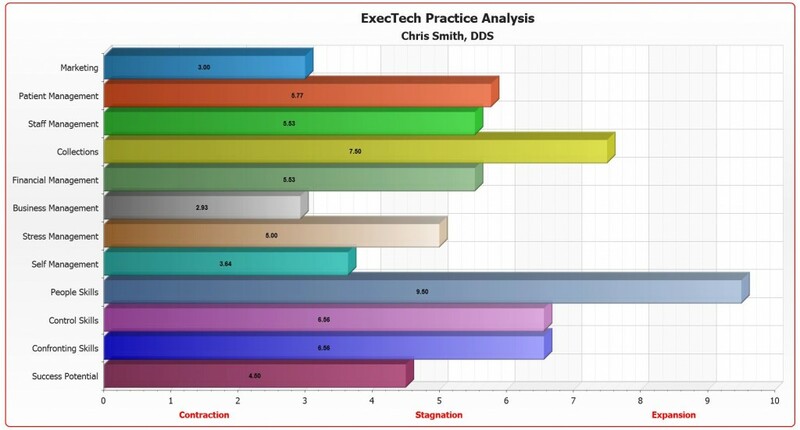 ExecTech’s Practice Management Analysis gives you a score for each of the twelve areas. It identifies your weaknesses and strengths. Low scores mean your practice is being damaged by those categories. High-scoring categories show where your strengths lie. In many cases, the practice has a constant battle between the elements that help you expand and the elements that make your practice shrink. In the example chart, Dr. Smith has excellent people skills which helps him with his patients and marketing. However, he is under a great deal of stress, probably from his other two low scores: staff management and financial management. As you can imagine, Dr. Smith’s practice and profit has been stuck for years. You can receive a free Practice Management Analysis at no charge. Click here to begin. Someone from ExecTech will contact you with the results. As well as recommending ways to address your weaknesses, we will suggest ways you can better exploit your strengths. The first category shows how you handle your practice’s public relations and promotional needs. If you cannot control the flow of new patients, or when you are too dependent on provider lists, you score low. A high score indicates you are effectively creating a positive image for your practice resulting in a steady flow of new patients. Attracting new patients, but then losing them through poor patient management, is a huge waste of time and money. Effective patient management produces appreciation, support and referrals. Weak patient management results in missed appointments, complaints and lawsuits. Your score will reflect the strength of your patient management skills. Fortunately, establishing life-long relationships with most patients is not difficult. Even if you are a brilliant clinician with thousands of loyal patients, you can only take your practice so far before you need others to help you. To create a productive team, you must skillfully hire, train, motivate, manage, discipline, reward, communicate with and lead your employees. A high score in this category shows you get performance, respect and support from your team. A low score means you are suffering from unnecessary stress and difficulty with your people. If you know how to collect 100% of your agreed-upon fees, helping your staff acquire this important skill is easy. You then have the funds you need to operate, improve and expand your practice while enjoying the rewards you deserve. Your score in this category will be high. If you do not have the skill to collect your fees, you become dependent on others for your income or you do not get paid what you deserve. Your score will be low. As you know, collecting 100% of your production does you no good if you spend it all on overhead costs. This category represents your ability to control your expenses while investing in your practice so your profits increase. As the senior manager, you ensure the practice is properly set up and organized to achieve maximum productivity. You oversee all policy and planning. You make the machine work. The skills required by the business-side of your practice are calculated into this category’s score, including goal setting, statistical tracking and legal protection. As well as managing your business, your staff and your patients, you also manage yourself. You control yourself, discipline yourself and reward or penalize yourself. You manage your time, your energy and your emotions. Weak self-management results in bad moods, low self-esteem and overwork. Your score will be low. A high score shows self-management that creates passion, enjoyment and love for your job. If you look at it, everything you want in life comes from others. For example, insurance companies don’t decide to pay you, individuals in the companies decide to pay you. The most powerful people in government, business and healthcare have the ability to make people feel cheerful, important and relaxed. A high score in this category means you understand people and get people to understand you. As a result, people believe you, support you and appreciate you. Without good people skills, you have personality conflicts, upsets and losses. Like nuclear power, your power can be used for good or evil. You can use it to attack or suppress others. Or you can use it to help people, increase everyone’s income and improve the world around you. For you to effectively control yourself, your people and your practice, you need to use positive, constructive control. If you use your power to hurt people, you lose control. Likewise, if you are afraid to use your power, you also lose control. Your score is low in this category if you are destructive or weak. A high score shows you are in positive control of your practice. Fear hurts you in many ways. It makes you avoid difficult people. It makes you doubt yourself. It holds you back. Fear changes your perceptions. Aggressive employees and patients seem dangerous. Advisors looks like con artists. Opportunities look like risks. Highly-effective practice owners face bad situations and challenges without hesitation. They never avoid critical employees, unhappy patients or difficult decisions. Without this level of courage, you give too much power to others. If you can face and deal with every conflict, situation and problem that occurs in your practice, you make better decisions. You seize the best opportunities. You make steady progress toward your goals. Like rust on a machine, stress slows you down and damages your performance. You become irritable, illogical and unmotivated. Stress causes mistakes, failure, frustration, illness and insecurity. Pressure and necessity can push you to succeed. So if your score in this category is high, you are relaxed; you have positive motivation or “good stress.” However, if your score is low, the stress is destructive. Your potential to succeed is, of course, unlimited. So how much of your potential are you using? Do you hold yourself back? Do you avoid help? Are you unwilling to explore new ideas? If so, you are blocking your potential to succeed. Your score will be low. A high score in this category indicates you are wide open to success. You take advantage of every opportunity. You have the mental flexibility you need to make changes and move forward.